The perfect choice for the modern and style-conscious man. 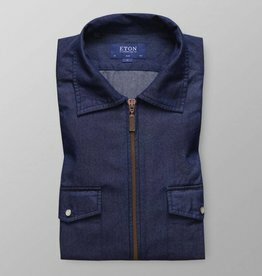 The classic Eton denim zipper shirt upgraded with the old Eton logo from 1948 embroided on the back. Dress it up or down depending on the occasion. Crafted in our soft denim fabric. The added side pockets and a two-way zipper elevate the functionality. We suggest wearing it with a T-shirt for a sporty and relaxed outfit or over a classic button-down shirt and grenadine tie to dress it up. Crafted from lightweight denim fabric and designed with a two-way zipper, this denim style is the perfect layering piece. 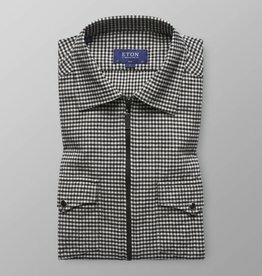 Crafted from the Eton soft flannel fabric equipped with a two-way zipper, this shirt is the perfect layering piece for this season. Details such as the double breast pocket and the push buttons add a contemporary feel to your outfit.